Book ahead to guarantee that your tour or talk is at a time that suits you, as numbers in the tower at any one time are limited. The Nannup Clock Tower is open every day of the year except Christmas day, from 9am to 5pm. 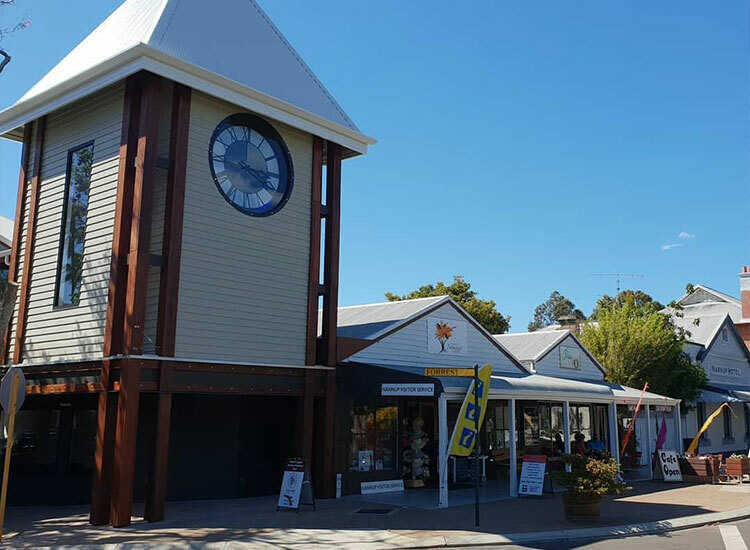 Book ahead to guarantee that you can visit The Nannup Clock Tower at a time that suits you, as numbers in the attraction at any one time are limited. If you want a guided tour or a talk by the clockmaker you will need to pre-book with at least 48 hours notice. This attraction is located on the second floor and will require visitors to be able to walk up and down a flight of stairs. Nannup’s location in the centre of Western Australia’s scenic South West, makes it the perfect place to base yourself for a weekend or week-long visit. In around an hour, you can be in most of the South West tourist towns – 50 min to Margaret River, 40 min to Busselton, 70 min to Bunbury and 40 min to Bridgetown. The Nannup Clock Tower has a bus which seats 11 plus the driver, which can be booked by groups of a minimum of 6 and a maximum of 11, travelling from Busselton or Margaret River to Nannup for the day. For bookings and prices please contact Rob Marshall on 0417099268. Located in the centre of Nannup and a short walk to The Nannup Clock Tower, Holberry House has 7 individual queen-sized rooms available which include a complimentary continental buffet breakfast. For travellers with young children or those who prefer to self-cater, Poppy’s Cottage is located in the centre of Nannup and consists of two queen rooms and one single, sleeping five in total. Located 17km south of Nannup on a working farm, Jarrah Glen Cabins offer a range of pet-friendly accommodation options in their charming, cosy cabins. Located 6kms north-west of town close to forest walks and the Munda Biddi Bike Trail, Loose Goose Chalets offer family-friendly self-catering accommodation options that suit couples or groups. A large function center is also available. Located in the centre of Nannup with both inside and outside dining areas, Pickle and O Cafe caters for groups of up to 20 people. Open Mon to Sat from 9:30am to 3pm, they’re known for their Devonshire Teas, Trout Rolls and Nachos. Contact Pickle and O between 9 and 4 on 08 9756 1351 or email Nicki Murray pickleando@hotmail.com. Nannup’s newest bike shop/ cafe is open from 7am to 3pm, 7 days a week, to caffinate and feed the early risers. Melo Velo is located in a heritage building on Warren Road in central Nannup. Apart from being a bike shop where you may well find the bike of your dreams, get it serviced or if you’re a tourist, rent one, Melo Velo has great coffee, food that nourishes and outstanding service. A place where people come together, where they share experiences, have conversations, where there is a sense of community. Contact Melo Velo on 08 97903112 or email shop@melovelo.com.au. At The Tiny Tea Shop, you don’t just drink tea, you experience the art of tea making with the delightful Patsie Smith. Enjoy the warm ambience of our cosy cottage while enjoying a good brew and home-made raw cakes, slices and handmade chocolates. 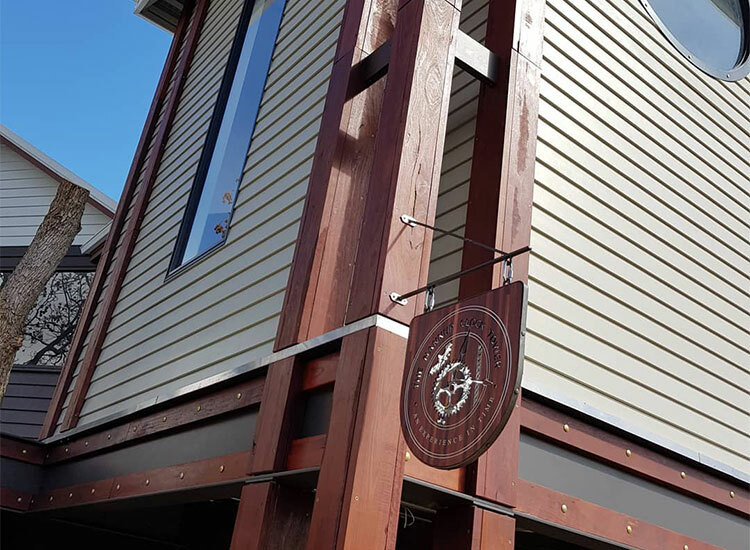 The Tiny Tea Shop is a loose-leaf tea specialist and the home of the Tuwawi Teas, a range blended specifically to suit the various human emotions. Located opposite The Nannup Clock Tower on Forrest Street, The Tiny Tea Shop is open Thursday to Sunday from 10am – 4pm. Contact The Tiny Tea Shop on tuwawitea@gmail.com. Looking for a unique venue to make your event truly memorable? The Nannup Clock Tower is ideal for Christmas parties, special birthdays and engagement or anniversary celebrations. The venue allows your group to comfortably enjoy a private and intimate time together and would suit a cocktail party arrangement. 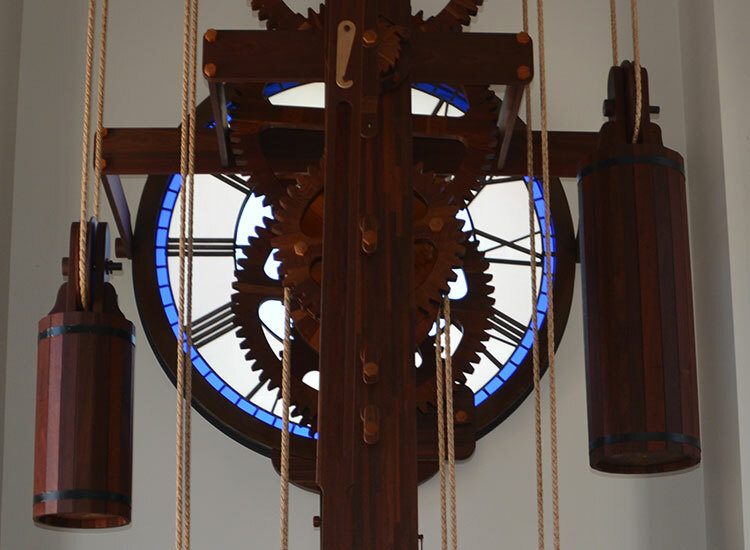 The area is upstairs where your guests will be able to admire the clock mechanism. Chairs and tables are available if required. Maximum capacity in the tower at any one time is 20 people. Hire available from 5pm to 8pm or 6pm to 9pm, 7 days a week. Bus your guests to and from the event in the Time Travel bus. Our local tourist website Everything Nannup is a great place to find out what’s happening in the area.